It’s well known that book covers and their blurbs are influential in our choice of novel and I’m as gullible as the next person when it comes to falling for a bit of propaganda. If the blurb reads An entertaining read, easy to digest - The Telegraph I’m more than likely to succumb to the thought of a delicious book feast or, at the very least, serve it up with mayonnaise. (I’m on a diet so even paper has become attractive; it has remarkably similar properties to lettuce.) And if it reads Best book since The Bible – The Sun naturally I will rush out and buy it as fast as my Zimmer frame will let me. Of course any opinion on a book is subjective but if you’ve read the blurb for The Devil Wears Prada or The Undomestic Goddess you might believe some publishers need prosecuting under The Trades Description Act. Anyhow my point is; on the rear cover of Don Juan de la Mancha it reads “One of the most entertaining comic novels of these past few years” so with this phrase in mind I set about reading with my Laugh-O-Meter and spare knickers to hand ready for a rip roaring rollercoaster of a read. Yes, I had failed to see Die Zeit. I now felt fully justified that I hadn’t been laughing my socks off. Because, and I ask you, what do the Germans know about comedy? Yes, yes I know those silly boots are hilarious but come on you’ve got to admit Brecht never really had you in stitches did he? Now the author of Don Juan de la Mancha is Robert Menasse, an Austrian, so I began to wonder if there were lots of in-house jokes about lederhosen and frankfurters that I simply wasn’t getting. But realistically how many gags can you have about Lederhosen and frankfurters? Not many. Well okay…quite a few about frankfurters… but this is a family site so let’s not go there. Published in more than twenty languages, Robert Menasse is one of the leading voices in Austrian literature and the recipient of numerous literary awards, as well as a prominent essayist and journalist. You are thick if you don’t like this book. So with my glasses placed studiously upon my nose, my Aspirin dissolved and my feather quill poised to make copious notes I set about reading Don Juan again. The novel, I decided, was like a crossword puzzle; once I had put myself into the mindset of the writer everything would fall into place. This time I resolved to read it through in as few sittings as possible having discovered on my first attempt that the proliferation of characters and the events jumping between the past and present made it easy to lose the thread of the story. Don Juan is Nathan, a 50 year old Austrian journalist working on the lifestyle section of a newspaper. Suffering from a midlife crisis and on the advice of his psychotherapist he recounts his life thorough an adhoc journal. It describes how his relationship with his father, his two wives and his many lovers have all proved, in some way or another, unsatisfactory. Although Nathan’s relationship with his mother is less tainted all her romantic liaisons have also failed. As the story develops we see that he has lived his life yearning for fulfillment and a constant need to find and feel sexual desire. Basically, Nathan is a man whose cup is always half empty and never half full. The past and future are always more attractive that the present and so he lives his life in limbo. When he consults the newspaper’s astrologer she tells him his birth is on the “border.” He is in between two personalities. Maybe this why he is so fascinated by females, their sexuality and why ultimately, even though it is comical, he ends up dressed as a woman. 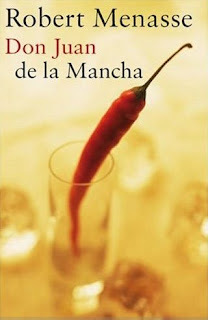 Don Juan de la Mancha is an intriguing book examining the relationships between men and women, sexuality and desire. It is sad, funny and poignant and I’m sure Freud would have dined out on it. It is the perfect fodder for those who wish to study the human psyche. However while the novel is all of these things, I never laughed, cried or felt deep empathy for any of the characters. In real life that is what we do. We laugh, we cry, we empathize, we feel. We don’t just observe. And so I closed the book feeling like I’d seen only half the picture. So is Don Juan de la Mancha a comic novel? Well it is – but for me that comedy came from visualizing the scenarios in my mind; the writing didn’t really speak to me. I’m not sure whether that is because the oomph was lost in the translation from Austrian, the irksome narration so none of the other characters really become alive, or whether Menasse simply can’t blatantly deliver the humour that the situations invoked. However, I can see this book translating extraordinarily well into film. In fact it would be the perfect material for Woody Allen but like his earlier films you’ll probably either love it or hate it. So there you have it. According to the blurb I’m thick and don’t understand Austrian humour. Damn. But since I just dressed up as a man I feel a whole lot better. Lederhosen or just regular bolier suit? Your review has me laughing - but sounds like more than the book. And no, I'm not a Woody Allen fan. You are crazy, Jane. Please don't ever regain sanity.